Lendonwood Gardens is an eight-acre botanical garden near Grand Lake in northeastern Oklahoma. Shady pathways meander through more than 1,200 different types of plants, including an amazing collection of rhododendrons, many varieties of daylilies, and several varieties of dogwoods. Lendonwood is home to the Oklahoma Garden, featuring “Oklahoma Proven” plantings as identified by Oklahoma State University. These are plants that thrive in our unpredictable climate. A pioneer-era village and history museum located on the shores of Grand Lake o’ the Cherokees. Visitors experience the area’s history and ecology through self-guided tours. Antiques, collectibles, and reproductions are displayed in exhibitions representing the mid-1800s to the early 1900s in the local four-state region (Oklahoma, Arkansas, Missouri, and Kansas). **FREE SHOW inside Club 60 West** Space is limited. Must be 18 years of age or older. All tunes are written recorded and performed by Eddie Valen. Eddie plays all types of instruments, while executing vocals. Monthly meetings are held the first Friday of every month for anyone interested in the art of quilting. Educational programs, workshops and charitable projects are offered. Today the museum will honor 2018 volunteers in a short ceremony at 10 a.m., and recruit additional community-minded individuals day-long. 2018 volunteers receive free admission this day. As a special treat, visit with Women's Baseball League player Gina Casey in the Visitor Center Back Gallery from 10am-noon. **FREE SHOW inside Club 60 West** Space is limited. Must be 18 years of age or older. With a long list of venues across the four-state area, Lucas Gates has the experience needed to perform at the highest standards of entertainment. Their range of music includes classic and current popular country music, classic and southern rock, Blues, and a long list of other genre’s to keep your guests entertained. Lear to identify and help others experiencing mental health problems and crises. This is a internationally accredited class and introduces participants to what mental illness is and how to help until professionals are available. The class is fun, uses exercises, role play, and is taught by an experienced mental health nurse. 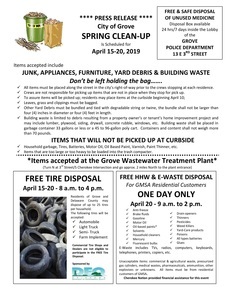 Please call Bruce Austin at 918 607 3122 by April 1st. Class size is limited to 30 participants, cost is $50 which includes manual and all materials and refreshments. Let the good times roll! Get ready for fun with friends, fabulous music and a night full of memories when Lickitty Split takes over the Venue 655 stage on Friday, April 12th, at 9pm Don't miss it! Calling all dogs and their owners! Representatives from canine-themed organizations visit Har-Ber Village today. Learn more about your furry friend! Guests will include Katie Menard of Collars for Scholars, a dog obedience business, and more. Museum admission is not required. The Service of Palms to remember Jesus' triumphal entry to Jerusalem. 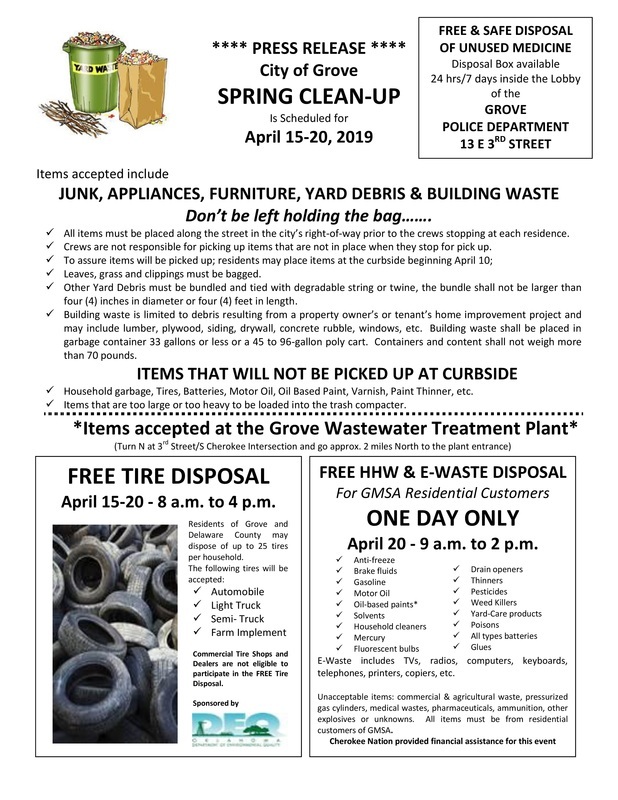 Ring in the Spring! 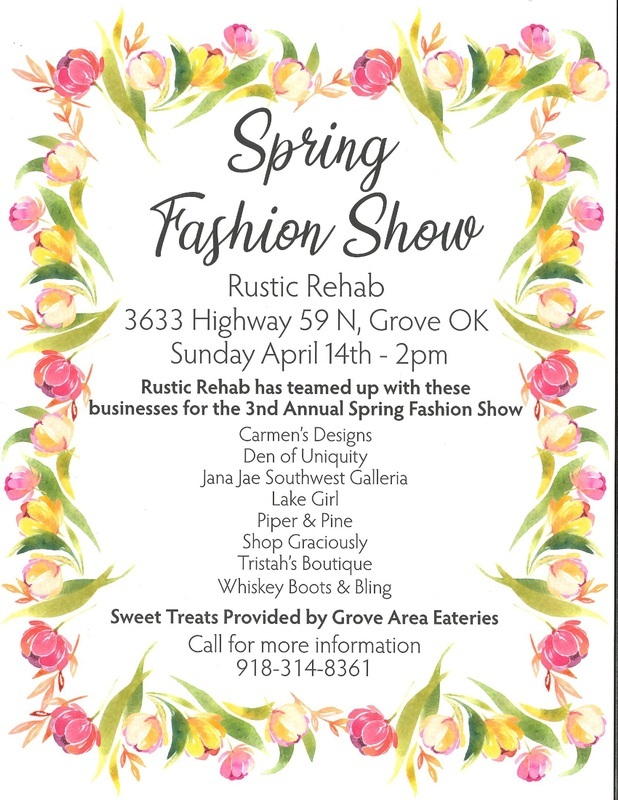 Be sure to plan to attend the 3rd Annual Spring Fashion Show at Rustic Rehab! The commemoration of the Last Supper at Passover. This night recalls the arrest of Jesus. **FREE SHOW inside Club 60 West** Space is limited. Must be 18 years of age or older. Eastern Heights is a modern country duo, with high energy, tight harmonies, and mind blowing musicianship. Eastern Heights consist of Lead Singer Rob Blackburn, Lead Guitarist and Musical Director Grant Moody. Although primarily a modern country band, the boys are very versatile and play multiple genres such as Rock, Pop, Disco, Funk, Classic Country, and Today's Country to name a few. Egg My Yard is a fun way to support Second Chance Pet Rescue! Your children, grandchildren (or favorite Easter egg loving person!) could wake up on Easter morning to the surprise of finding their yard filled with colorful plastic Easter eggs stuffed with treats.You can choose how many eggs you want delivered to your house. You will also need to choose the night that you want them delivered; Friday, April 19 or Saturday, April 20. Address must be within a 15 mile radius from the shelter. You can order securely and safely online, or go into the shelter to place your order. 100% of the proceeds from Egg My Yard will go to continue to provide outstanding care to the homeless pets in the shelter! The Service of Good Friday commemorates a portion of the time Jesus was in the grave. Head on over to Grand Lake Casino for our 1st ACL regional event!! Test your skill in our singles and doubles competitions, and test your luck at the slots and tables between matches. Did I mention $1.50 drafts and margaritas all day?! Get pre-registered today because the event is capped at 20 teams!!! 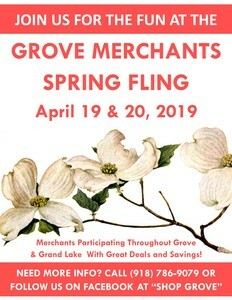 Hop on in to our local shops and restaurants for some Egg-tra Special savings during the Grove Merchants Spring Fling! Dinner & A Show inside Club 60 West Event Center Tickets: $20 A nationally-recognized ventriloquist and comedian, Todd Oliver puts on a family-friendly show full of laughter, magic, and music, featuring his talking dog Irving and a rotating cast of characters. As Irving the Talking Dog says, “You’ll be howling for more!” As seen on The Today Show, The Late Show with David Letterman, The Tonight Show, America’s Got Talent (Top 4 Finalist), and more! Scavenger hunt on the Nature Trail. Instructions at the Har-Ber Village Museum Visitor Center. Museum admission is not required. Hop on down to the Bernice Area of Grand Lake State Parks for the 14th Annual Easter Egg Hunt. Peter Cottontail himself will be arriving in the park with candy and toy filled Easter eggs for children 12 and under to gather. Peter Cottontail will be available for photos before the event. This event will take place rain or shine. The Vigil of Holy Saturday commemorates a portion of the time Jesus was in the grave. 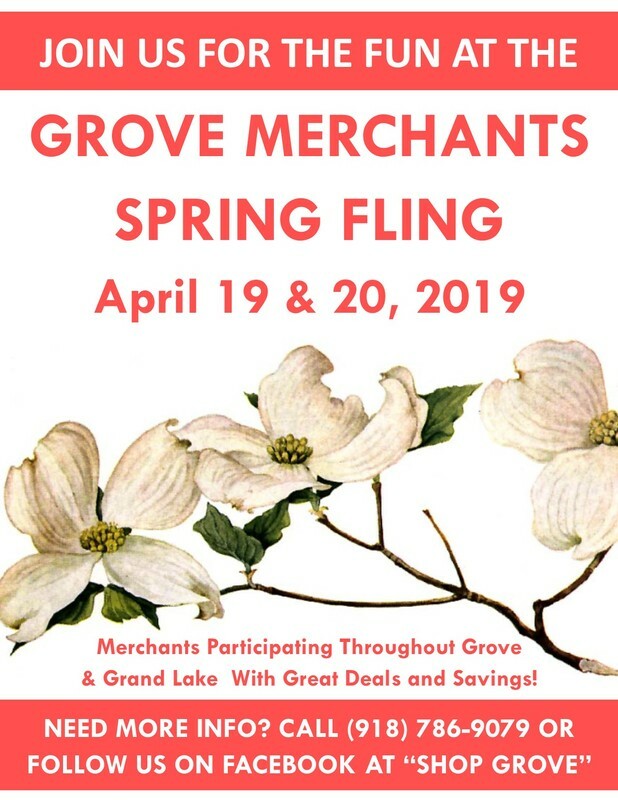 Apr 20, 2019 | 11 a.m. - 2 p.m.	| The Muddy Pearl - Annie's Galleria - 414 E. 3rd St. The Easter Bunny will be visiting The Muddy Pearl at Annie's Galleria for three hours on this date. Be sure to get your little ones in to see him before he hops off to his next location! A beautiful Service celebrated as the sun rises on Easter morning. One of the most beautiful Services of the church year. Followed by an Egg Hunt. 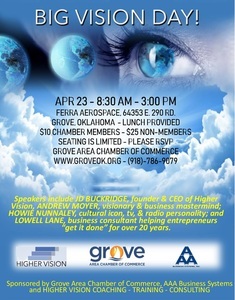 Speakers include JD BUCKRIDGE, founder & CEO of Higher Vision, ANDREW MOYER, visionary & business mastermind; HOWIE NUNNALEY, cultural icon, tv, & radio personality; and LOWELL LANE, business consultant helping entrepreneurs “get it done” for over 20 years. **FREE SHOW inside Club 60 West** Space is limited. Must be 18 years of age or older. Lickitty Split is a group that brings the beat to any party or show! Located in northeastern Oklahoma, they travel all over Oklahoma bringing the life of the party wherever that might be! They play a wide variety of music from Country, Rock and Blues insuring everyone will hear that tune they love! They keep the dance floor hopping, and can tailor their show for their audience. 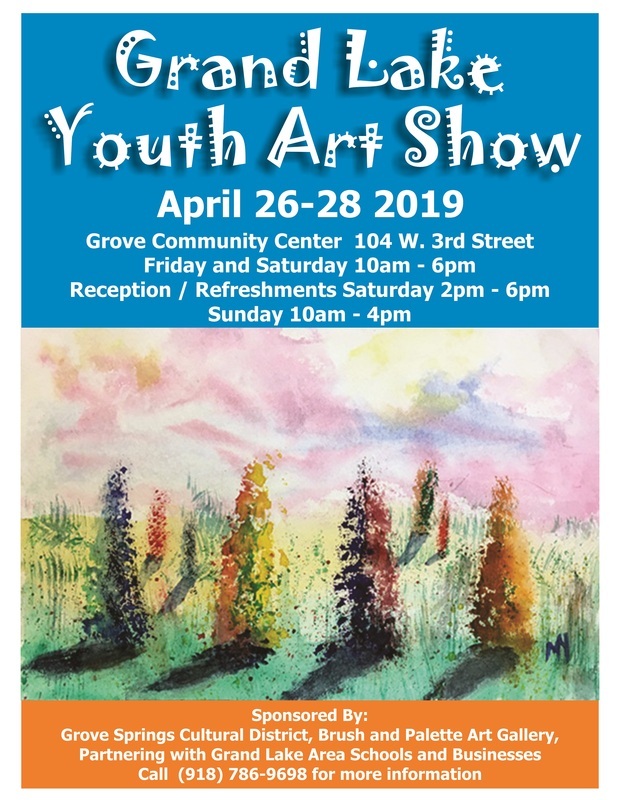 Event hours are 10 a.m. - 6 p.m. Friday and Saturday and 10 a.m. - 4 p.m. on Sunday. Refreshments will be served from 2 p.m. - 6 p.m. on Saturday. 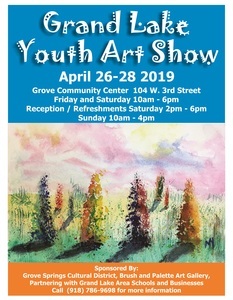 The event is sponsored by members of the Grove Springs Cultural District, Brush & Palette Art Gallery - in partnership with Grand Lake area schools and businesses. 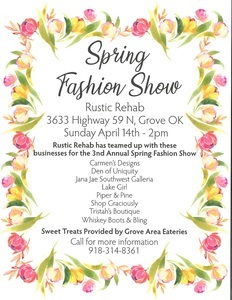 For more information call 918-786-9698. Are you ready to rock out? Torn has a sound that everyone is sure to enjoy. Serve us some frosty mugs and enjoy this free show at venue 655 inside Grand lake casino. Celebrate the Grand Opening of Har-Ber Village’s Nature Trail with fiddle music, celebratory messages, and trail mix! Thank you to the Oklahoma Tourism Department’s Recreational Trail Program and the many volunteers who made this possible! Museum admission not required.